Dufay Collective: Instrumental and vocal music from the middle ages and reniassance. The Dufay Collective has been performing and recording its unique brand of early music since 1987. During this time the group has performed at major festivals and toured throughout the world, receiving critical acclaim from Cairo to Carlisle. The group has made a series of highly successful recordings of a wide-ranging repertoire of instrumental and vocal music from the Middle Ages and Renaissance, including the Grammy nominated 'Cancionero'. Their recordings have all met with critical acclaim, but never resting on their collective laurels the group, now directed by William Lyons, strive to create entertaining and informative performances and recordings. They can also be heard on the soundtracks of several feature films including Hamlet, Harry Potter 3 and Shrek 3. 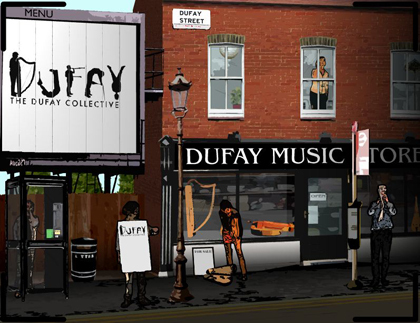 Dufay Collective lives in London, England. Tagged as: Classical, Renaissance, Classical Singing, Composer: Antonio de Cabezon, Composer: Enriquez de Valderrabano, Composer: Francesco Canova da Milano, Composer: Francisco de la Torre, Composer: Juan de Anchieta, Composer: Juan del Encina, Composer: Luis de Narvaez, Flute, Lute, Viola da Gamba.